Joanne joined Evans & Co at the end of 2016 after working at Winn Solicitors in Newcastle for over 13 years where she specialised in road traffic accident claims. Joanne studied for a LLB (Hons) Exempting degree at Northumbria University and completed her training contract at Kidd & Spoor Harper Solicitors in Newcastle. She was admitted to the roll of solicitors in November 2000. Joanne works mainly from our Spennymoor office but is also available to meet with clients at our Ferryhill offices and provides free initial interviews/advice and participates in our free legal surgeries at both offices. Pursuing compensation claims for those injured at work, in road traffic accidents and other types of accidents. This includes claims for physical injuries, psychological injuries and financial losses arising from such injuries, for example, loss of earnings, care and assistance, future losses and expenses and vehicle damage related losses in road traffic accidents. Joanne has extensive experience of dealing with litigated claims including preparation for trial. 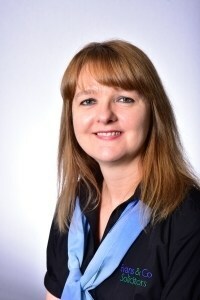 Joanne has vast experience of the civil procedure rules and has dealt with a variety of civil dispute matters including landlord and tenant, contractual disputes, debt recovery and compensation claims. She is experienced in dealing with small claims track, fast track and multi track matters. Joanne is experienced in dealing with disputed matters that have not been issued at court. This can involve corresponding with an opponent/their representative to narrow the issues, undertaking negotiations and reaching settlement to conclude a matter without the need to go through the court process. In her spare time Joanne enjoys worldwide travel, walking the family dog, reading and spending time with family and friends.